I saw this posting on BBC Travel, which then linked to a collection of 1930's travel posters from the Life archives. There are some nice images in this set. Today's Sunrise Serenade was "Nagasaki" by the Benny Goodman Sextet. Click on the song title to listen courtesy of Jazz On Line. The playlist for the June 29, 2011 broadcast of the Swing Shift Shuffle has just been added to the playlist filing cabinet. This entry in the 2011 Seattle Vintage Jazz Dance (SVJD) Swing/Jazz Dance Music Video Contest is a spin on a sequence from the 1949 film noir classic, The Third Man, starring Orson Welles. Enjoy The Dancing Man. This morning's Sunrise Serenade was "Seven Come Eleven" by the Benny Goodman Sextet. Click on the song title to listen courtesy of Jazz On Line. The Red Hot Lindy Hop continues its weekly lesson and session this Friday with a lesson by Angela and Kirk with music by Josie and Kirk. Free admission before 7:00 p.m., and $5 at the door afterwards. This morning's Sunrise Serenade was "There'll Be A Hot Time In The Town Of Berlin" from a V-Disc by Frank Sinatra. Enjoy the song in the YouTube video blelow. Last summer, while visiting an antique shop in Mississippi, I found an old set of Memphis postcards. The cards were printed on both sides of one, long strip of cardstock. 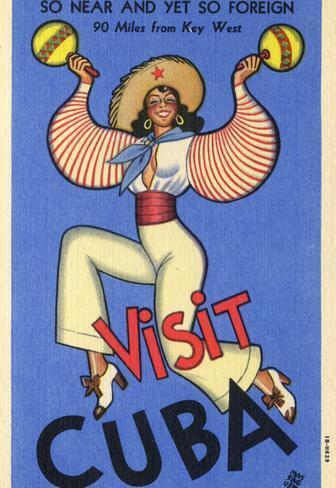 They folded, accordian-style, into an envelope to which they were attached, the front and back of which also carried postcard images of Memphis. The only damage to the set was where someone removed the postage stamp. The postmark is from 1938, but judging by some of the images (particularly the cars in the scenes) it is possible the cards were published in the late 1920s to early 1930s. For only $10, I could not resist them, and I thought I would share some of them with you from time to time. The above images are the front and back of the envelope. The flap on the back tucks into a slot, and it is printed to match the image underneath when closed. This morning's Sunrise Serenade was "Rhythm Is Our Business" by Jimmie Lunceford and His Orchestra. Click on the song title to listen courtesy of Jazz On Line. There is nothing like a little good, old fashioned, American propaganda from World War II. In this Warner Bros. short, Bugs Bunny forgets to make a left turn at Albuquerque (again), and winds up in the Black Forest, face to face with Luftwaffe commander Herman Goering. There are elements of other WB cartoons in this film, including Bugs dressed as a Valkyrie, and doses of Strauss and Wagner. The last scene is very interesting, with an apparently favorable portrayal of a certain international leader. From the Internet Archive, here is Herr Meets Hare. I have seen several posts recently related to GMC during the Swing Era, and here is another. 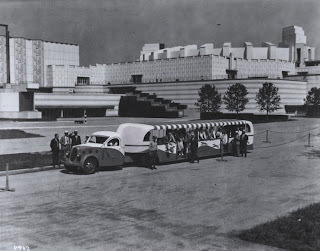 Hemmings posted this item about the custom buses GMC produced for Greyhound to haul people around the 1933-1934 "Century of Progress" World's Fair in Chicago. According to Hemmings, "Captions on the photos noted that the trailer coaches were the only motorized transport allowed on the grounds of the fair, and that they carried more than 20 million attendees throughout that time." This morning's Sunrise Serenade was "Hi Ya Sophia" by Benny Goodman. Click on the song title for a sample clip courtesy of emusic. Click here for the emusic album page. 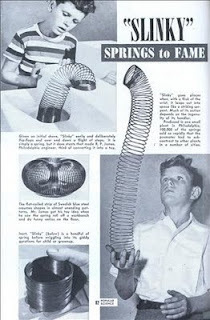 From the "I did not realize it was that old" department: This article from the September 1946 issue of Popular Science, posted on Modern Mechanix, reveals the origin of the Slinky. Growing up in a single story home with no steps, I always felt unable to fully exploit the full potential of mine. Today's Sunrise Serenade was "Ko Ko" by Duke Ellington and His Orchestra. Click on the song title to listen courtesy of Jazz On Line. The playlist for the June 22, 2011 broadcast of the Swing Shift Shuffle has just been added to the playlist filing cabinet. As promised last week, here is another entry in the 2011 Seattle Vintage Jazz Dance (SVJD) Swing/Jazz Dance Music Video Contest. This video, "Quiet Please," took second place. This morning's Sunrise Serenade was "The Honeydripper" by Memphis' own Jimmie Lunceford. Click on the song title to listen courtesy of Jazz On Line. 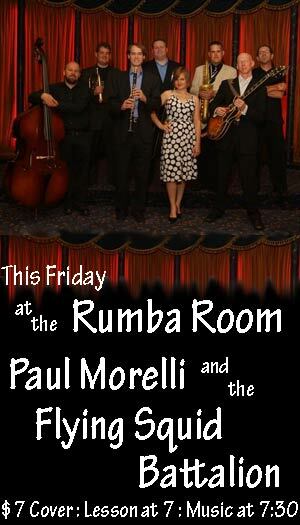 The Red Hot Lindy Hop features live music this Friday by Paul Morelli & the Flying Squid Batallion, plus a free dance lesson by Michael and Amanda. The lesson starts at 7:00 p.m., the music starts at 7:30 p.m., and there is a $7 cover. This morning's Sunrise Serenade was "Rose Room" by the Benny Goodman Sextet. Click on the song title to listen courtesy of Jazz On Line. 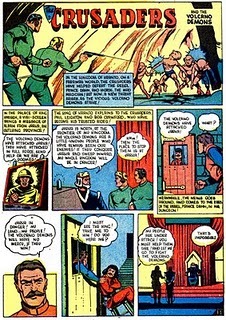 From Pappy's Golden Age Comics Blogzine, here is a strip of Canadian origin called The Crusaders, published in 1945. Despite the medieval name, it is a Buck Rogers/Flash Gordon style futuristic adventure. Screwy Squirrel always struck me as MGM's version of Bugs Bunny. He never rose to Bugs' level, but he is still pretty funny. 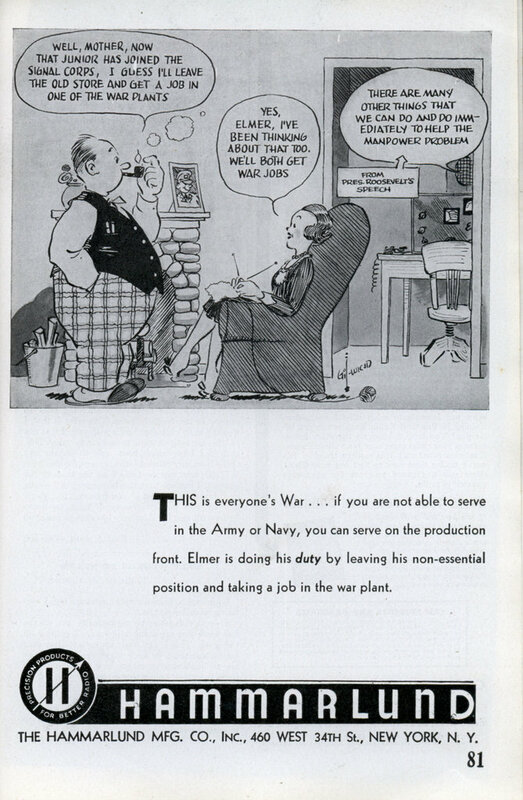 From the Internet Archive, and filled with World War II home front gags, here is The Screwy Truant, directed by Tex Avery. I knew the 1936 Olympics were held in Berlin, complete with speeches by Hitler, and African-American Jesse Owens winning several gold medals. 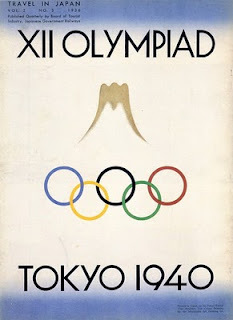 I did not know that the very next Olympic games (1940) were to be held in Germany's Axis partner, Japan. 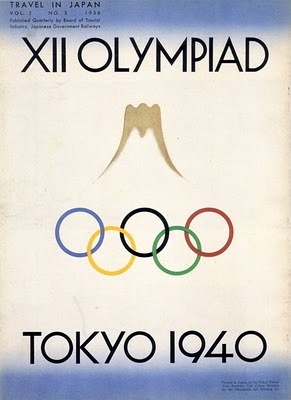 The games were cancelled due to the ongoing war between China and Japan. Dieselpunk posted this very elegant poster advertising the games. Today's Sunrise Serenade was "Basin Street Blues" by Benny Goodman and His Orchestra with Jack Teagarden. Click on the song title to listen courtesy of Jazz On Line. 1939 Pontiac - Completely Rust Free! Plexiglass does not rust. As I first saw on the Hemmings blog (and since on others), GM built this very unusual see-through Pontiac sedan as a display for the 1939 World's Fair in New York. I cannot help wondering about the weight difference between this show car and the normal steel version. Talk about good visibility. GM built two – possibly three – transparent cars for the New York World’s Fair of 1939-1940, one of which was a Deluxe seven-window touring sedan (B-body), the other of which was a Torpedo five-window touring sedan (C-body). It’s the former that was featured in the SIA article and which we see for sale here today . . . .
Sunrise Serenade: Got A Penny, Jenny? This morning's Sunrise Serenade was "Got A Penny, Jenny?" by Stan Kenton and His Orchestra with June Christy on vocals. Click on the song title for a sample from emusic, or click here for the album page. The playlist for the June 15, 2011 broadcast of the Swing Shift Shuffle has just been added to the playlist filing cabinet. Sometimes you find something that just makes your day, and my day has officially been made. I spend so much time concentrating on original material from the Swing Era, that I often miss or overlook some wonderful things in the present. Today I am able to take a rare journey into the depths of the contemporary and feel right at home. Henrik at Swing, Jazz and Blues posted the video below of "Black Coffee" by the band Careless Lovers from Seattle. Aside from thoroughly enjoying the video, I learned that it won the top prize at the 2011 Seattle Vintage Jazz Dance (SVJD) Swing/Jazz Dance Music Video Contest. You read right -a music video contest based around Swing Dance. These folks have earned a spot in my heart, and I will be posting more videos from this year's contest in the weeks to come. Enjoy, it's a solid killer diller! Today's Sunrise Serenade was "High Tide" by Count Basie and His Orchestra. Click on the song title to listen courtesy of Jazz On Line. The Red Hot Lindy Hop continues its weekly lesson and session this Friday with a lesson by Meghan and Jaredan and music by Jaredan. Free admission before 7:00 p.m., and $5 at the door afterwards. Next week: Live music by Paul Morelli & the Flying Squid Batallion. U of M Swing every Tuesday, Fieldhouse Room 118 from 7:00 to 9:45 p.m. Free taster lesson from 7:00-8:00 p.m. Topics vary from week to week and include East Coast Swing, Lindy Hop, Charleston, Blues and Balboa. All are welcome and no partner is required. Open practice from 8-9:30 pm. Improve your moves during this dance time. Ask questions, come practice your swing dancing and have fun with other Memphis swing dancers! This morning's Sunrise Serenade was "Sweet Rhythm" by Cab Calloway and His Orchestra. Click on the song title to listen courtesy of Jazz On Line. In 1916, he enlisted for the remaining duration of World War I, joining the London Scottish Regiment as a private, serving alongside his future successful acting contemporaries Claude Rains, Herbert Marshall, and Ronald Colman. He later transferred with a commission as a lieutenant to the Liverpool Scottish, 2nd Battalion, where he served as an intelligence officer and eventually attained the rank of captain. 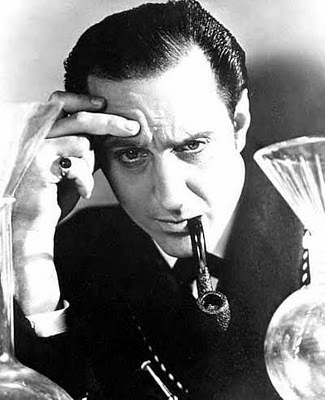 During the war, Rathbone displayed a penchant for disguise (a skill which he coincidentally shared with what would become perhaps his most memorable character, Sherlock Holmes), when on one occasion, in order to have better visibility, Rathbone convinced his superiors to allow him to scout enemy positions during daylight hours instead of during the night, as was the usual practice in order to minimize the chance of detection by the enemy. Rathbone completed the mission successfully through his skillful use of camouflage, which allowed him to escape detection by the enemy. In September 1918, he was awarded the Military Cross. This morning's Sunrise Serenade was "Brotherly Jump" by the combined orchestras of Jimmy and Tommy Dorsey. Click on the song title for a sample from emusic, or click here for the album page. Based on the credits, it appears this version of a 1936 Fleischer Studios cartoon was made for release in France (or perhaps Quebec), although the minimal dialogue is in English. This short has an interesting mix of styles, from regular animation, to the depth-of-field technique for which the Fleischer's were known, to the apparant use of live action model trains. The overall story is cute, with a warning for reckless children. From the Internet Archive, here is Play Safe. 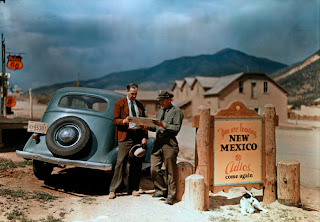 How To Be A Retronaut posted an amazing set of color photographs from all over America during the 1920's and 1930's. To those of us who grew up with old black & white movies, it is hard to imagine that life was anything more than a spectrum of black, gray and white. These pictures demonstrate, with startling vividness, the more colorful aspects of life at the time. Today's Sunrise Serenade was "Perdido" by Duke Ellington and His Orchestra. Click on the song title to listen courtesy of Jazz On Line. Now that is design. 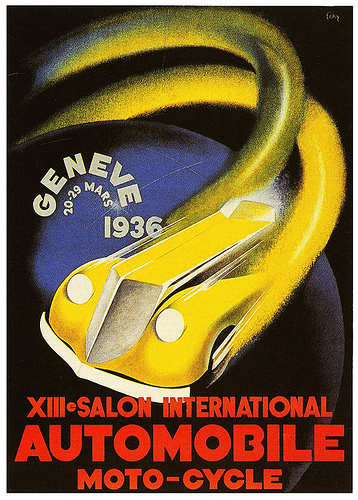 Dieselpunk posted this poster from the 1936 Geneva International Automobile Show. This morning's Sunrise Serenade was "A String of Pearls" by Glenn Miller and His Orchestra. Click on the song title to listen courtesy of Jazz On Line. The playlist for the June 8, 2011 broadcast of the Swing Shift Shuffle has just been added to the playlist filing cabinet. The weekly Red Hot Lindy Hop lesson and session continues this Friday with a lesson by Mike and Erin with music by Mike and Josie. Free admission before 7:00 p.m., and $5 at the door afterwards. Today's Sunrise Serenade was appropriate for early morning: "Lullaby of Broadway" by Ambrose and His Orchestra. Click on the song title to listen courtesy of Jazz On Line. Over on Matinee at the Bijou, Victoria Balloon searches for the mysterious location in America of Andy Hardy's hometown, Carvel; providing interesting insights into MGM's Andy Hardy series of movies along the way. These films are snapshots of an America never quite touched by the Depression or the looming war in Europe. Nothing really bad ever happens. At the most difficult moments Judge Hardy is there for a “man to man” talk with Andy, and when Judge Hardy needs comfort, there is always the simple wisdom of “Mother” Hardy. I didn’t have a hometown, but I knew what a hometown was supposed to look like from the Andy Hardy pictures. You could walk to the drug store for a milkshake or ride a bike to the movies, and you could drop in on friends without having to arrange permission and a ride days in advance. This morning's Sunrise Serenade was "Forty Second Street" by the Boswell Sisters. Enjoy the song below, or click on the song title to watch on YouTube. Today marks the 67th anniversary of "Operation Overlord," more commonly known today as "D-Day," the Allied invasion of Nazi-occupied Europe. The newsreel below from the Internet Archive reveals what and how the public learned about this massive operation. This morning's Sunrise Serenade was "Toy Trumpet" by Raymond Scott. Click on the song title for a sample from emusic, or click here for the album page. As I have mentioned before, some cartoons from the 1930s are a bit weird, and this short is no exception. Some of the references to dental hygene can be explained by the fact that a toothpaste company commissioned the cartoon, but even accounting for the sponsorship, it is still a bit odd. Nevertheless, you have to love the chorus of "Sing, Sing, Sing" from the elves. From the Internet Archive, here is "Boy Meets Dog." I love a good hood ornament. The hood ornament was a descendant of the radiator cap, which sealed the top of early car radiators, and sometimes included a coolant gauge. While some radiator caps were plain and utilitarian, others became decorative. As radiators became enclosed by grills and bodywork, automakers kept the decorative aspect through the hood ornament, which usually served no functional purpose. These ornaments often became the heraldic crests of the manufacturers, e.g. Packard's famous "Lady and the Wheel." Some Plymouths in the mid-1930's carried a great Art Deco sailing ship representing the Mayflower. 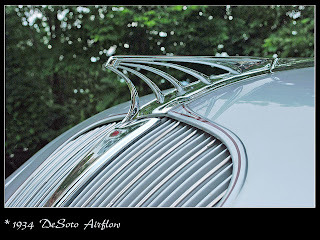 Below, posted on Dieselpunk, is a photo of a 1934 DeSoto Airflow hood ornament in all its streamlined glory. This morning's Sunrise Serenade was "Opus No. 1" by Tommy Dorsey and His Orchestra. Click on the song title to listen courtesy of Jazz On Line. This posting on Modern Mechanix has several interesting characteristics. QST was apparently an amateur radio enthusiast magazine, and Hammarlund was a radio manufacturer. 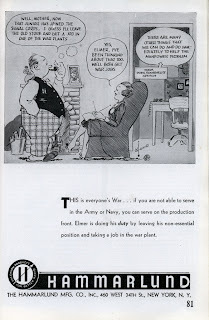 In this December 1942 ad, the company encouraged people to support the war effort by leaving their "non-essential" jobs to work in war production plants. This morning's Sunrise Serenade was "My Old Man" by the Spirits of Rhythm. Click on the song title to listen courtesy of Jazz On Line. The playlist for the June 1, 2011 broadcast of the Swing Shift Shuffle has just been added to the playlist filing cabinet. As the temperature heats up, keep cool at the weekly Red Hot Lindy Hop lesson and session this Friday with a lesson by Jaredan and Meghan and music by Jaredan. Free admission before 7:00 p.m., and $5 at the door afterwards. This morning's Sunrise Serenade was "Sepia Panorama" by Duke Ellington and His Orchestra. Click on the song title to listen courtesy of Jazz On Line.